Yom Ha’atzmaut 2014: Is the Jewish State Truly Free? The massive Palestinian protest rally in the clip above took place this past Tuesday, on the day Israelis celebrated as Yom Ha’atzmaut (Independence Day). What’s particularly notable about this rally is that it didn’t take place in the West Bank or Gaza, but rather in Israel proper. More precisely, it took place on the site of the village of Lubya in the lower Galilee, one of hundreds of Palestinian villages depopulated by Jewish militias in 1948 to make way for the founding of the State of Israel. This protest was part of an annual event known as the “March of Return,” which has taken place inside Israel for the past 17 years. Organized by a coalition of Palestinian groups, the march annually promotes the conviction of Palestinian citizens of Israel that Israel’s independence is irrevocably bound up with the Palestinian collective tragedy known as the Nakba. 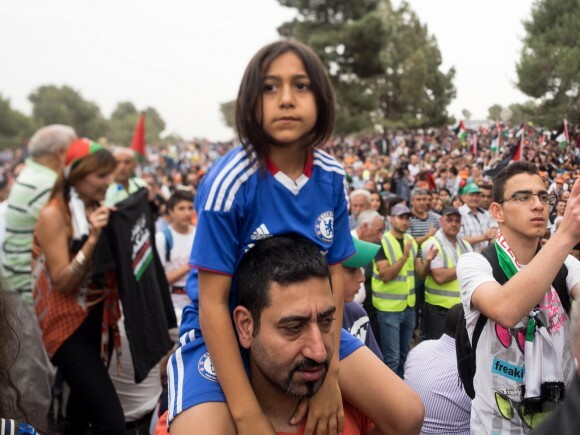 By all reports, this was the largest March of Return yet; an estimated 10,000 Palestinian citizens of Israel defied Israel’s anti-Nakba law, driving and hiking past angry Israeli-Jewish counter-demonstrators and police who confiscated their Palestinian national flags. Then they gathered together at Lubya to hear from a variety of Palestinian politicians and activists. Most notably, this year’s commemoration included explicit calls for a recognition of the Palestinian right of return. Several years ago I wrote that I believed Yom Ha’atzmaut should much more appropriately be observed by Jews as a day of reckoning rather than a day of unmitigated celebration. Watching the clip above, I am all the more convinced of this than ever. Can a nation truly celebrate itself, as its national anthem would have it, as an “am chofshi be’artzeynu” (“a free people in our own land”) when it includes a minority such as this in its midst? Most of the holidays are mentioned in the Bible or were created in ancient time and there is already a tradition…Every Jewish holiday, usually, you have a text. This is something special about the Jewish culture or religion. As a religious Jew, I personally take great exception to the use of the term “sacred text” in reference to such a patently political document as Israel’s Declaration of Independence. For me, it is yet another sad example of how political advocacy for the State of Israel has become so firmly (and idolatrously) ingrained in the religious life of the American Jewish community. It’s very important that we keep on making sure that people that are not Jewish will get equal rights and the same opportunities…The declaration gives us a very good vision, as a start of the discussion. To those Arabs that took part today in the “Nakba Day” procession and waved Palestinian flags, I suggest that next time they march directly to Ramallah and they stay there. This entry was posted in American Jewish Community, Civil Rights, Human Rights, Israel, Judaism, Nakba, Palestine, Religion, Yom Ha'atzmaut on May 8, 2014 by Rabbi Brant Rosen. i want to thank you for the strength of your integrity to have your voice for peace for the children of israel, in the face of the rabbinic role in politicizing the discord between israelis and palestinians….your voice supports the freedom my own…. Thank you, Rabbi Rosen, from rainy Seattle. I do believe that many American Jews, particularly the young, are shifting their thoughts on the Occupation, Settlement, Palestinian rights, etc. Dylan nailed it, and the times are changing. Keep up your great work. “Is the Jewish State truly free?” This is an important, if controversial, question. I like the way Rabbi Rosen answers this question, so am reblogging his recent post here. By law Palestinians are second class citizens. This makes the answer to your question: Yes. I have just read on Al-Monitor an account of the Social Reconciliation Committee formed by Fatah and Hamas in their current attempt to reconcile. It appears to be based on the Truth and Reconciliation Commission that helped South Africa leave apartheid behind. Wouldn’t it be ironic if this reconciliation involving Hamas offered an on-the-spot example for a future reconciliation between Israeli Jews and Palestinians?